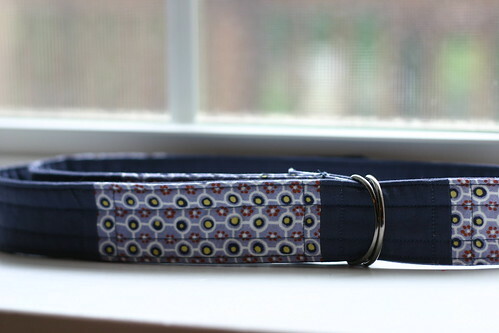 Made a new belt…, originally uploaded by SewLaTea. I have been wanting to make some belts like these and these, but could not for the life of me decide which fabrics to use! I finally decided to go simple to start, and went with a pair of fabrics that have been lying around and have had no good use thus far. I intended to use them for a Mei Tai baby carrier, but just never got around to it after making the first one! I grabbed these two fabrics and immediately thought of a new jacket I got at the Gap that will go perfectly with jeans and some flips. And hey it goes with a lot of other stuff too 🙂 I used this tutorial by Not Quite Vintage and because I’m instructionally challenged, I made one little goof, but no one would notice or care….eh, you live, you learn. Now I need to hit Etsy and grab some vintage belt buckles!